Obama said the “notion government action can be effective” needed to be resuscitated and conceded that the failures of the Chicago Housing Authority and the Chicago public school system made people less inclined to have faith in government. “The trick… is figuring out how do we structure government systems that pool resources and, hence, facilitate some redistribution, because I actually believe in redistribution, at least at a certain level, to make sure that everybody’s got a shot,” Obama said. 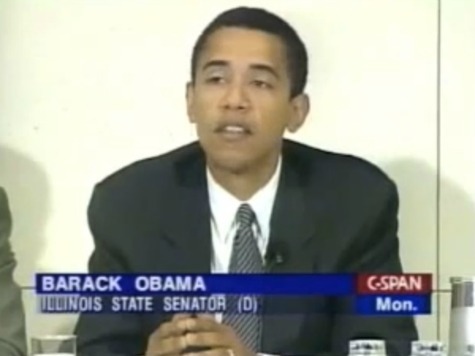 Obama’s 1998 comments about the failures of Chicago’s government institutions were prescient, because his administration’s policies have made Americans trust government even less. And the ongoing Chicago teacher’s union strike has symbolized government workers run amok. And the president’s views on “redistribution” have likely not evolved. During the 2008 campaign, Obama infamously told Joe “The Plumber” Wurzelbacher that he wanted to “spread the wealth around.” Obama has also actively and openly campaigned on his belief that wealthier Americans should pay their “fair share” in more taxes. Obama’s past comments on redistribution came to light a day after the left-wing publication Mother Jones released a video in which Mitt Romney, at a private fundraiser in May, spoke about how the 47% of Americans who do not pay federal income taxes would not be inclined to vote for him. Obama’s and Romney’s comments, taken side-by-side, represent two clear contrasting visions about what Obama and Romney fundamentally stand for and how they view government. Obama is perfectly fine that 47% of Americans pay no federal income taxes, because as fewer Americans have a stake in how their taxpayer dollars are spent, they become more dependent on government while the government becomes less accountable for how they spend taxpayer dollars. His policies have encouraged more government dependency. In August, for instance, more Americans went on food stamps than landed new jobs. He continues this policy even though, at some point, there will not be enough wealthy Americans to tax in order to fund all of the government programs and services demanded. Romney, on the other hand, is for reducing dependency on government, lowering taxes, reforming entitlements to preserve them for future generations, and lessening regulations that stifle innovation and burden small business. Romney believes his vision will lead to the creation of 12 million new jobs, lowering the unemployment rate, which Obama has not been able to do.